Discussion in 'Sim Racing Hardware' started by Evan Madore, Feb 17, 2011. Hey everyone. My G27 is on its way to my door. The stock wheel on it is so small, I am going to be replacing with a real wheel. Anyway, there are sooo many wheels out there, I was wondering if you guys wanted to help me search. I am looking for as cheap as possible. Any ideas would be appreciated. The amount to look through is overwhelming. So far I have found a few "maybe's". If you want, you can read my wheel swap saga. http://insidesimracing.tv/forums/viewtopic.php?f=108&t=2511. I would rec that you get a really good quality wheel like a MOMO/SPARCO/OMP. It will save you a lot of second guessing later. Pay the price up front or you might end up going thru a few wheels like I did. I wanted to get a cheap wheel when I first started and that was what I got a cheap wheel. The silver rim'd 350mm MOMO/OMP clone is actually not bad, but its polyurethane not leather and yes you can tell the diff even when wearing race gloves. It really depends on what size and style of wheel you want, that will determine the weight. The MOMO Mod 88 ("D" type squared bottom) I use is under 3lbs and it's a 320mm, the 350mm version of the same is closer to 3lbs. The MOMO Mod 78 (round) wheels are also around the same weight and they come in 330mm and 350mm versions. The ISOTTA wheel that I have is very light, never weigh it since my bathroom scale is not that accurate. I would say it's def lighter then the MOMO's I listed. Again the MOMO/SPARCO/OMP are not cheap, they range from ~$180-$280USD unless you want a Carbon Fiber one and that is ~$900USD... . There are clone wheels that don't weight all that much. One of the earlier ones I have is close to MOMO weights. Some others are a lot heavier tho. Just don't get a wheel with all the plastic and all the other fancy stuff like fake CF and horn buttons on spokes etc stuff on it, it just adds weight. Get the simplest looking wheel in the price range you want and it would prob be the lightest. 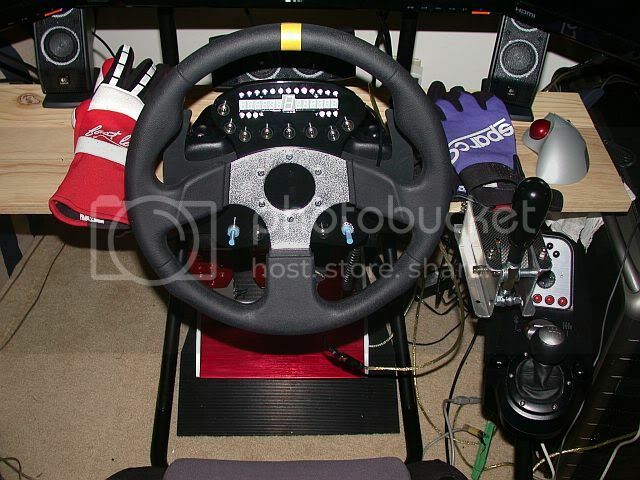 Also if you plan on using paddles shifters do not get a deep dish offset (or so call drift) wheel, you will never be able to reach any paddles on a G25/27 with one of those. A very slight dish (MOMO ) is fine and flat (ISOTTA) works but you might want to add a spacer if you want some clearance for your fingers between the paddles on the G25/27 and the wheel. If you are not planning to add a wheel plate like me, then you can get a slightly heavier wheel. Just all per pref. Bottom line is what ever is the most comfortable and eye pleasing for you will be the right one. ADD: if you plan on using a Chilicoke (or the soon to release SIMRACN) adapter, you better make sure that the wheel is a six hole pattern with 70mm or 74mm spacing. you could allways try the car reckers if your looking for a cheaper option, i was lucky enough to find my wheel in a reckers once when i was buying some replacment parts for my car and the wheel was hanging on the wall behind the counter, sure its not new but for $75 im not complaining and it looks good and fits my red/black colour scheem. Just a sugestiong if you dont mind using a second hand wheel and want to save some $$$$. in this pic ive added some buttons but you get the picture. Thanks for the help guys. Well, with all the other modifications I will be doing to this thing, a real Momo/Nardi/OMP (expensive wheels) are just out of the picture. I guess I will need to watch the weight. I am planning to make a button plate that supports buttons and the SymProjects screen. If things come out too heavy however, I will just completely rip apart the G27 and make a metal shaft supported by pillow blocks. I was planning on doing this sometime anyway. That is the clone 350mm MOMO/OMP wheel I got from Malaysia off e-bay. They no longer sell that wheel but here is their site. They have other wheels. Also if you plan on using the Chili make sure the six wheel hole pattern is 70mm spacing and compat with MOMO/SPARCO/OMP. Most clone wheels are but I would make sure. BTW: I have the SS-01. The SS-01 mini LCD is pretty thick and some what tall and wide. Might be a probm trying to get it mounted on a close top wheel. May need an open top wheel to mount unless you can work out a way to have the wheel plate on top of the wheel instead of under. As far as weight goes, the G25 can take a lot but for me a lighter wheel just feel more nimble for some reason. My lap times don't change much, but just the perception of the lighter wheel feeling quicker. Awesome. I wish I could find more good looking wheels like those on EBAY. 14" might be on the large side for me. I am just going to make up an adapter, either of metal or something like HDPE. Haha. A 320mm sounds pretty good for me then. I do a bit of open wheel, some prototype and sports cars, but overall I would say touring cars.